An Icelandic family recently harvested a monster 5 kilo eggplant from their summer home near Ísafjörður. The mother posted the picture on Facebook and received quite a big reaction, with some people not believing it was real, and possibly a fake done with Photoshop. 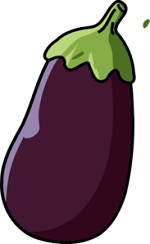 * After making this post RÚV updated the original story to remove references to it being an eggplant, so yes, it’s a squash. Sorry! Risavaxinn kúrbítur gerði Lilju Dóru Harðardóttur og fjölskyldu heldur hissa þegar þau voru við uppskeru í sumarhúsi sínu á Borg í Skötufirði við Ísafjarðardjúp á dögunum. Fjölskyldan ræktar þar grænmeti og ávexti í gróðurhúsi og uppskar tæplega fimm kílóa eggaldin. A gigantic squash astonished Lilja Dóra Harðardóttur and her family when they were harvesting at their summer house at Borg in Skötufjörður near Ísafjarðardjúp recently. The family grows fruits and vegetables there in a greenhouse and harvested a nearly 5 kilo eggplant. The phrase að gera hissa means to surprise/astonish (someone). In this paragraph both the verb for harvest as well as its noun form are present with uppskera. Þetta kemur fram á vef Bæjarins Bestu. Lilja Dóra segir í samtali við fréttastofu Ríkisútvarpsins að hana hafi ekki órað fyrir að myndin sem hún deildi á Facebook af dóttur sinni, Birnu, með grænmetið myndi vekja svo mikil viðbrögð. Margir hafi talið að um töfra myndvinnsluforritsins Photoshop væri að ræða. Nú bíður kúrbíturinn í ísskáp fjölskyldunnar en að sögn Lilju Dóru tímir enginn í fjölskyldunni að skera það. This was reported on the web site Bæjarins Besta. Lilja Dóra says in an interview with RÚV that she never imagined that the picture that she shared on her Facebook page of her daughter Birna with the vegetable would get such a huge reaction. Many thought it was faked using Photoshop. Now the squash waits in the family’s refrigerator, and according to Lilja Dora nobody can bring themselves to cut it up. The verb að óra is used in impersonal expressions and takes the accusative, which is why hana is used in hana hafi ekki órað fyrir að. Although fyrir að is used here, it can also be followed by a noun in the dative, or an expression with því (það in the dative). The example sentence given on the BÍN site is Mig óraði ekki fyrir þessum erfiðleikum – I never imagined these difficulties. Gróðurhúsið er um 100 fermetra plasthús sem hitað er upp með blásara og heitavatnsrörum sem lagðar eru undir moldina. „Það er ótrúlegt hvað hægt er að rækta norður á hjara með smá fyrirhyggju.“ segir Lilja. Auk þess að rækta kúrbít ræktar fjölskyldan gúrkur, tómata, epli, vínber, baunir, jarðarber, papriku, salat og kryddjurtir en aðeins til einkanota. Hún segir að fjölskyldan prufi nýjar tegundir á hverju ári sér til skemmtunar. The greenhouse is a 100 square meter plexiglass house heated with fans and hot water pipes under the ground. “It is unbelievable how it is possible to grow so far north with a just a little forethought,” says Lilja. Besides growing squash the family grows cucumbers, tomatoes, apples, grapes, peas, strawberries, paprika, lettuce and spice plants, but only for their own use. She says that the family tries a new kind every year for fun. There’s a nice list of fruits and vegetables that you normally only find in a beginning Icelandic textbook 🙂 I translated paprika as pepper, since I don’t think you actually grow paprika, but rather the peppers that you make it out of. But maybe it should be paprika.